Sweet or candy trees are a unique centre piece for any party. They are unusual and interesting and something which is fun to make. Sweet topiary trees can be made in any design depending on the occasion. 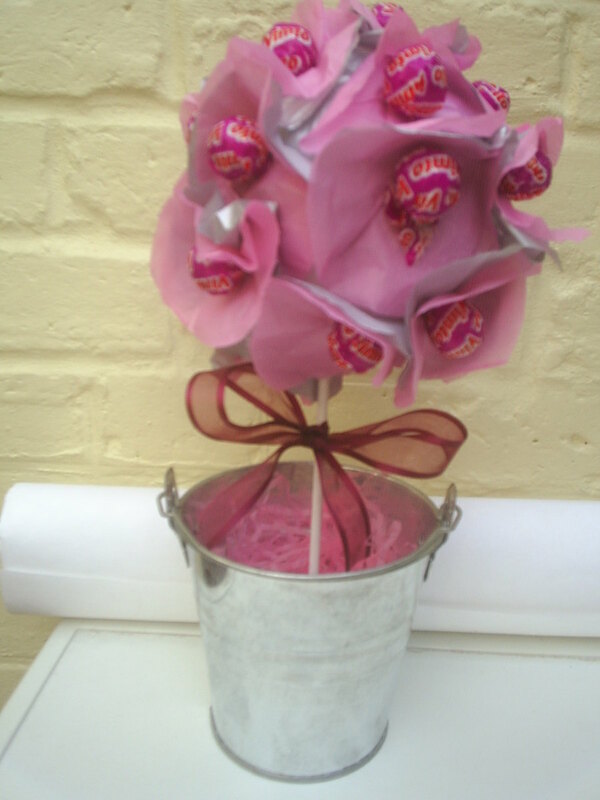 They are simply handcrafted decorations in the shape of a tree covered in sweets or lollipops. They look effective on tables at weddings, christenings or birthday parties, and a great idea for children. As well as looking quite cute in the centre of your table, they also have a function at the end when guests come to eat the sweets! There are many people who make these and sell them. They can have any sweet you wish such as lollies in the colour of your choice, marshmallows, luxury chocolates or smarties. To make them more elegant, add ribbons, bows or paper flowers. Put them in a nice base such as a glass vase or coloured pot and decorate the stems. For children’s parties make them bright and fun and even make the tree into the shape of the child’s initial. There are so many different ways to make sweet trees. What do I Need to Make Sweet Trees? A pot or vase. This will be the base so choose the colour and style according to the celebration. 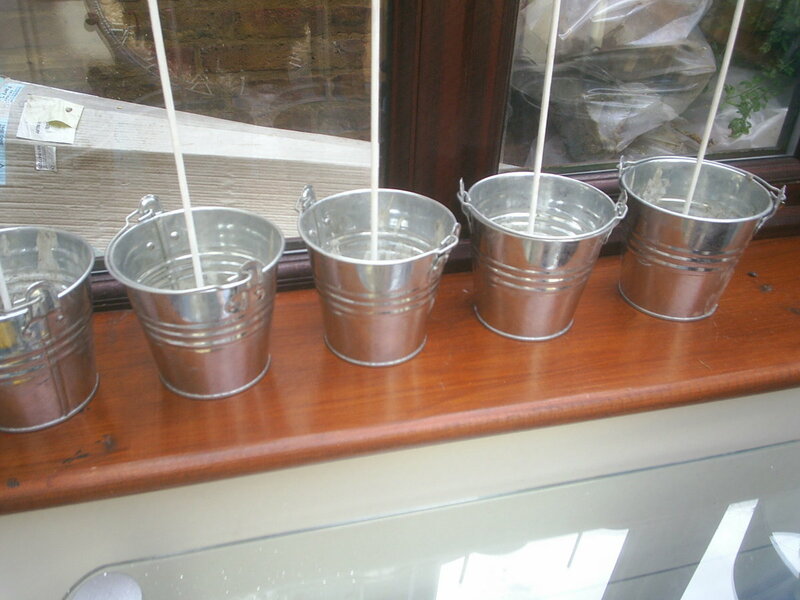 You can use a new flower pot and decorate it or buy coloured buckets. Plaster of Paris or Concrete. This will hold everything in place. Sticks or Doweling. This is the tree trunk. Polystyrene balls or Flower Oasis. Choose the shape you want. Ribbon, tissue paper or anything else you wish to decorate your tree. How do I Make Sweet Trees? Prepare you pot by filling halfway with plaster of Paris or concrete. It may not look very attractive but you can cover it over later on. Place your stick into the pot and let it set. Ensure the stick is straight! If you have a wooden stick you can always paint it if you prefer. Leave them for a couple of days to set properly. 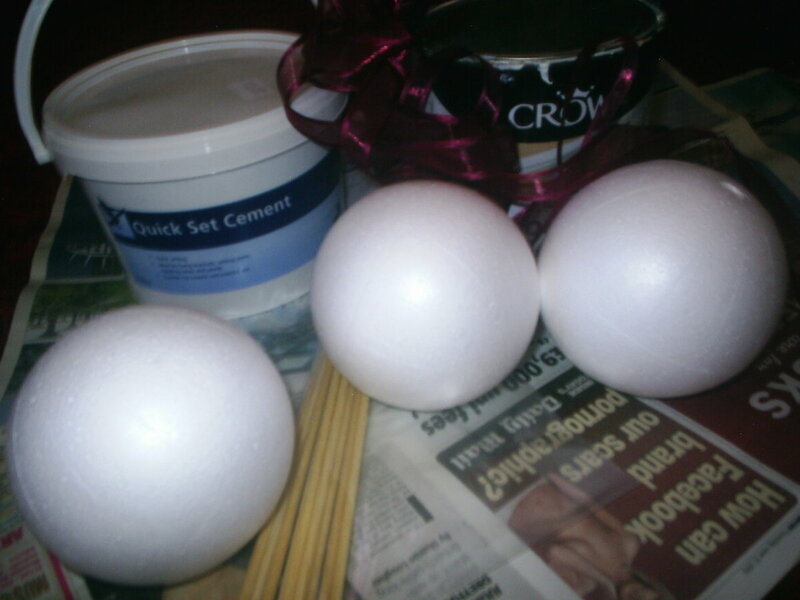 Next decorate your polystyrene or oasis ball. Cover it with tissue paper if you are worried about gaps, glue the tissue paper with a glue stick. If you are using sweets such as mini packets of Love Hearts or Liquorice Allsorts you can use a cocktail stick to secure. But be careful if small children are eating the sweets as they are sharp. Alternatively use edible sugar glue (or craft glue if they are in wrappers). If you use lollipops just poke them straight into the ball. They will remain secure. If you choose to cover the whole of the polystyrene with lollies or sweets you will need a lot if you don’t want gaps. 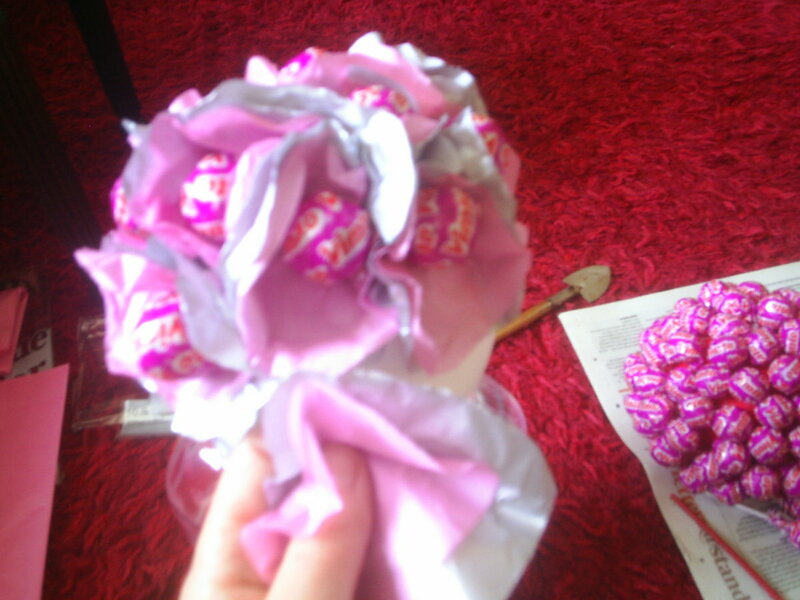 You can use less if you put tissue paper flowers or bows in between the sweets. 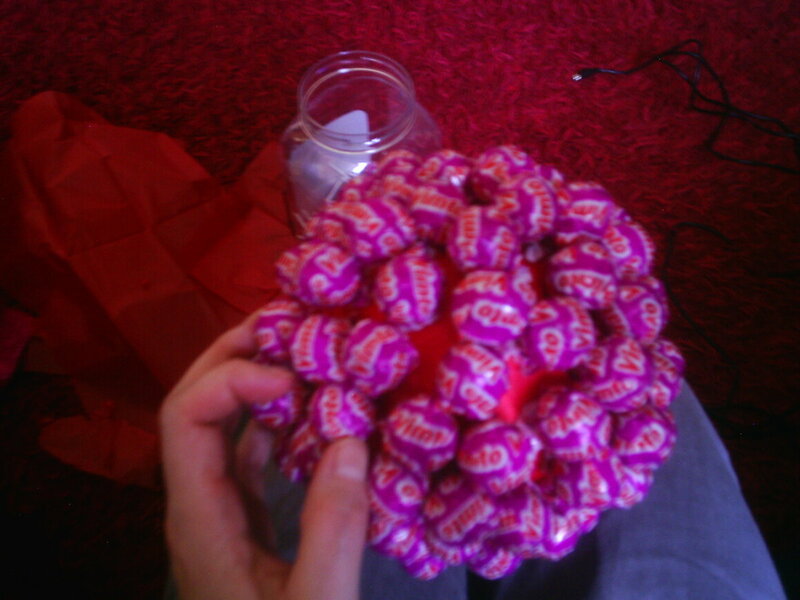 You can also make petals with tissue paper and put the sweets in the centre to look like flowers. Use different sweets if you want it more decorative or make flower shapes using coloured sugar coated chocolates. Once you have finished the top, poke it into the stick making sure it is secured. Decorate the stem with ribbon and cover the plaster of Paris or concrete with more sweets, confetti or shredded tissue. They are then ready to go on the tables! Make a few for a nice effect either all the same or different. For a wedding, go with your colour scheme. They make a nice alternative to flowers and can be made in advance. If your sweets are not in wrappers, just cover it over in cellophane until the big day. Then wait and see what the guests think! Hi Lavinia - I have seen Barbie trees where the Barbie has a dress made of sweets. Make a neckline on the Barbie with the buttons, and decorate with cupcake silver balls or edible glitter for extra bling. You are welcome. Thanks SamitaJassi! Oh gosh that video had my toes tapping and my mouth watering. If my Grandad was alive today I would make him a liquorice all sorts tree. He loved them. Thanks Natashalh - I can't really remember when I first came across them but it was something I wanted for my wedding. They are quite different. I've never heard these called sweet trees. Actually, I've never thought about what they might be called! These are really pretty. Hi Louise - yes they are edible. When I did mine, I used lollipops. 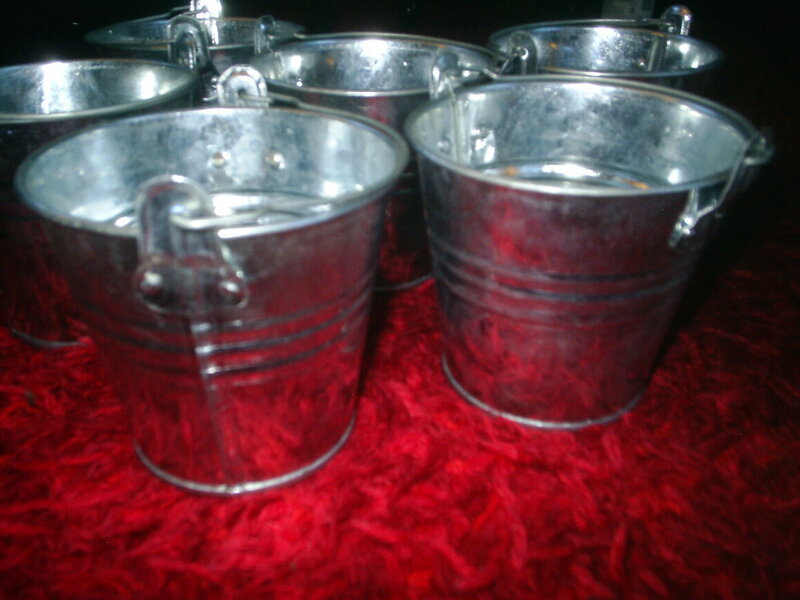 Everyone at my wedding helped themselves to the lollies and I had sweets in the bucket too. 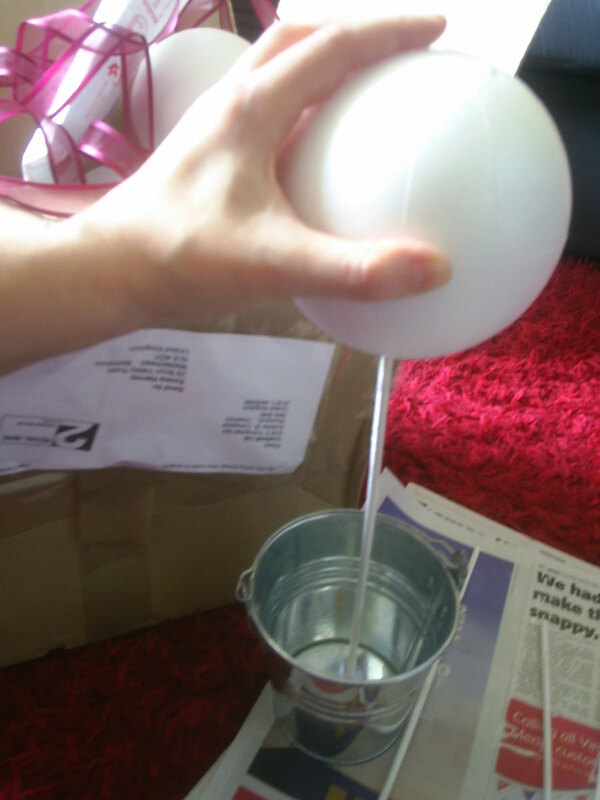 Ones with edible glue should come off, or try wrapping the ball in cellophane. It may be trial and error, so make a few smaller ones as testers. In regards to selling food - I can only guess you'll need a food hygiene certificate. Check with your local authority what else you will need such as public liability insurance (in case you get accused of food poisoning etc). Maybe do a bit of research if you intend to make a business out of it. Hi, these are great, and looking to do something like this from home as I have kids. Are these trees for eating or just for decoration, as I was wondering if they are glued on with edible glue whether they would come off ok? Also do you know if you would need a health certificate to sell these? Hi Zoe - you can buy edible sugar glue which would be perfect for sticking the buttons to the tree. You can also buy different shape balls, such as hearts or cone shapes. Just stick your buttons around it - see how it goes! how would u make a chocolate button tree? Yes - something you can peal the sweets off easily. I wanted to do my sweets like that, but I was transporting them a long way and was worried the sweets would come off. I like the ferrero rocher version of the sweet tree - plus they are in wrappers so it doesn't matter. But my wedding day was very hot so chocolate would have been a bad idea if it melted..
Hope your sweet trees are a success - good luck! If you are wanting to use edible glue to glue the sweets to the ball, for instant large chocolate buttons that have no wrapper, what would you cover the ball with? Maybe cellophane? The pots are 5 inch pales. The concrete weighs it down and the balls are light, so it shouldn't topple over. Just make sure the sticks are securely in the balls. I made my sweet trees in August and the ones left over are still standing. They have traveled a long way too! Hi Caroline - they were probably around 100 - 120mm balls. I got a box of 10 from ebay. You can also buy heart shapes as well. They sell them especially for making sweet trees. Hi just wondering what size the balls you used are?? Hi lois - I got the sticks from ebay, but you can also get them from garden centres. where do you get those sticks from that you use for the stem of the tree? I've seen them made with glass bases. Maybe use florist oasis and fill the vase with the sweets to cover around the oasis. Or try using coloured glass beads or coloured sand as an alternative to make the base attractive and weighty. What is your pot made of? Is it plastic? The ones I used were metal - maybe you need a stronger pot. Cement will expand as well, so may well have caused this. So I started to make a sweet tree. I have made the base but the pot I have used has cracked overnight what have I done wrong? I bought everything from ebay. 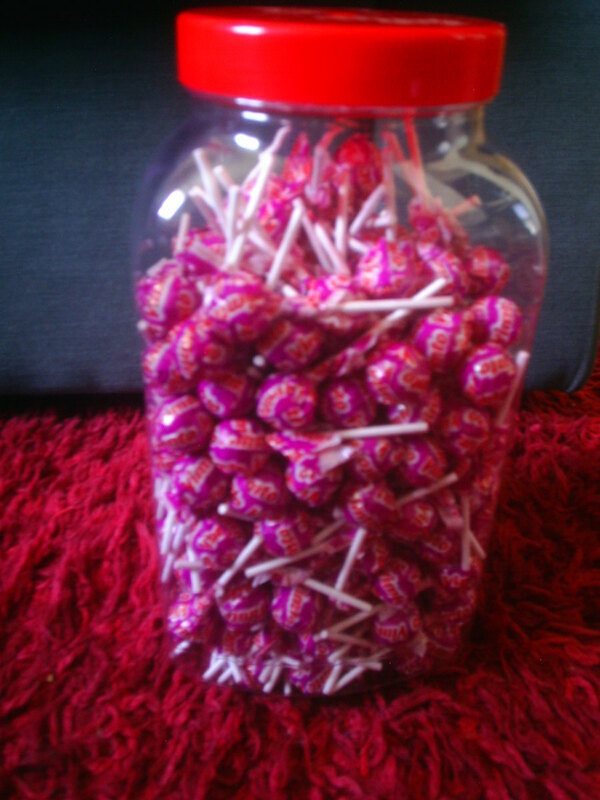 I got 5 pots, a pack of canes (also try garden centres), concrete from a diy store, and the sweets in bulk from ebay. If you buy the kit from ebay they cost around £10 each (british pounds), but it is cheaper if you buy it separate and in bulk. These look great, would like to give them a go but where would you buy the pots from? Hi His princesz - thank you so much for the share. Glad you liked my sweets! 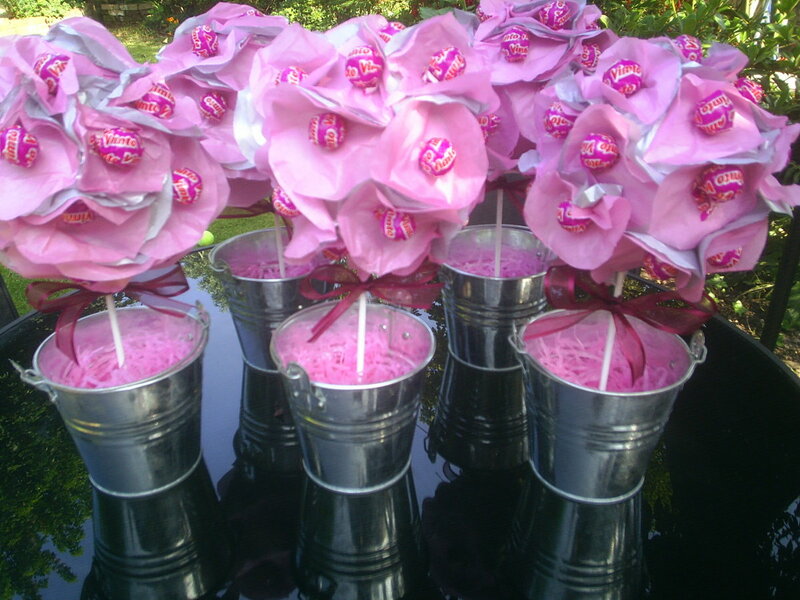 alifeofdesign - these sweet trees are so easy to make and are lovely gifts. Wrap them in clear cellophane and tie with a ribbon to make them look pretty. I still have some of those trees left over from my wedding, but I may make some new ones. They are really fun! Nice step by step hub. Thanks. 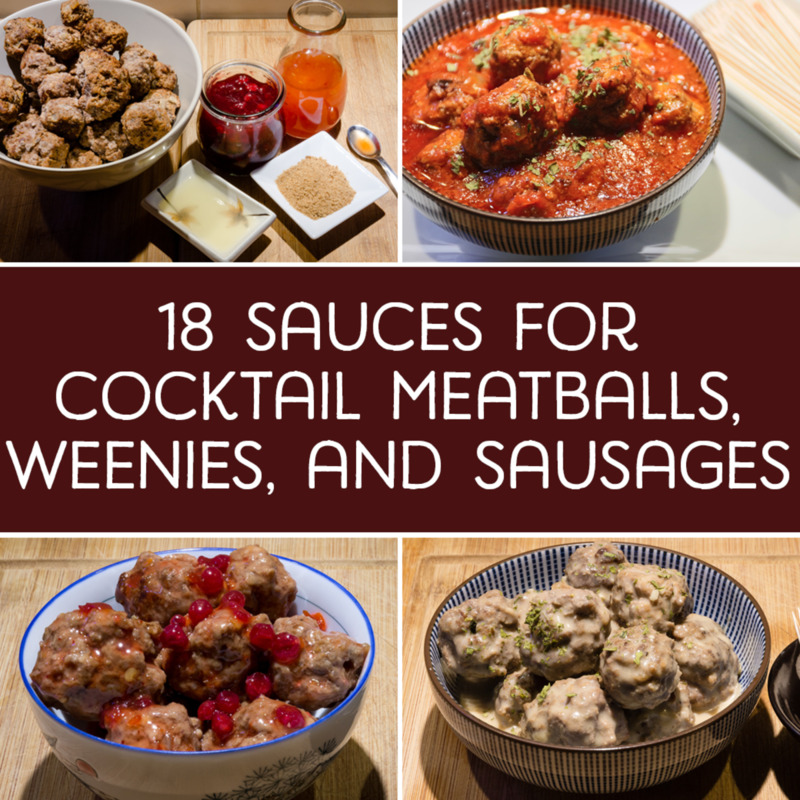 I think that this is a great idea for holiday hostess gifts. I guess that I'll put it on my 'must-make' list. Hi vibesites, there are companies and independent businesses who make sweet trees to sell. Some are really impressive, but they must spend hours crafting them. If you have the talent then why not start up a business from home? 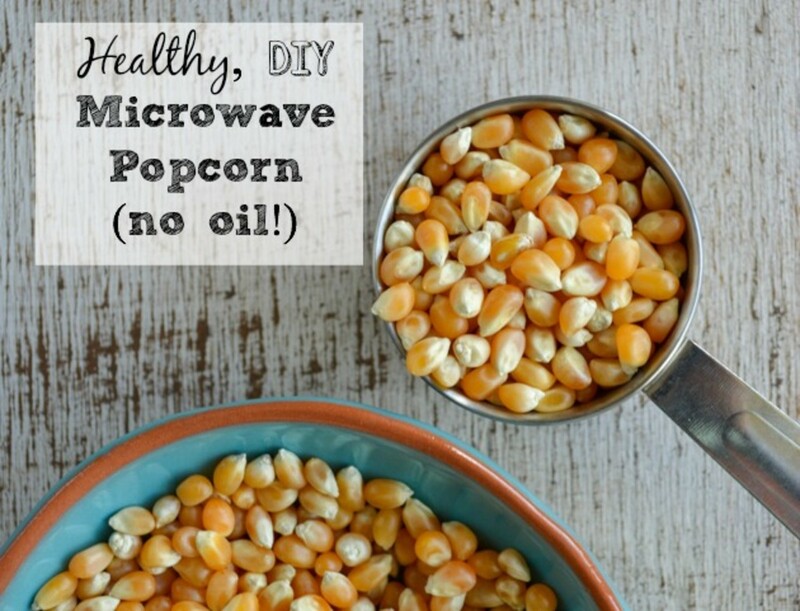 Great for stay at home parents too. Good luck! Leah, that's such a cool idea. The kids would love that! They are such a good idea for different occasions and parties. I may make more for my son's Birthday at the end of the year. Those are so very cute, Emma! Those would make great decorations for a party... I might make some black/orange ones for Halloween decorations! By now I am guessing that you are married. Congratulations. I think these are wonderful decorations for a wedding. Wishing you and your hubby a long life of happiness together. Many sweet returns! Wow, this is something I've never heard of. What a great gift idea and fun to make! Shared and bookmarked! Thank you so much Om and Riverfish. When I first saw these sweet trees I was inspired to make them myself. Thanks for your comments and tweet! How lovely! Thanks for the instructions and photos. Rated up and tweeted! I got married 3 weeks ago. If I can give you an advice: enjoy your wedding to the fullest, as it will end way too early :). This is my experience. Good luck and I wish you loads of happiness! Thank you zsobig and ishwaryaa22! I'm so glad my trees were a success - they will be used for my wedding next week! An engaging hub with an uniquely creative idea - sweet tree! Your directions are clearly explained with helpful photos, followed by an equally engaging video! Well-done! Wow, this is an incredible idea, I have never heard of it! But in the near future I will surely give it a try - probably will make a nice gift for my mom :).